WHY USE SEAMLESS ROOFING VANCOUVER? Our cold-applied process means a safer roofing application, and eliminates the risk of fire damage to the structure. Backed by our 25-year warranty, our liquid applied roofing membrane is built to last – even in Vancouver’s wet climate. What’s in a name? Our roofing system is fully seamless, eliminating the possibility of joint failure that leads to leaks. 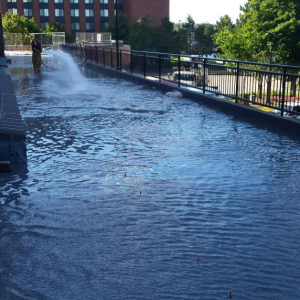 The seamless nature of our roofing technology makes it ideal for flat roofs in Vancouver, which are prone to water pooling and can experience drainage issues. 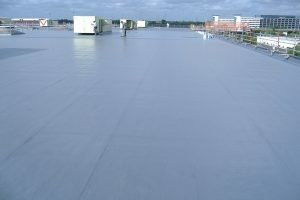 Without joints, our roofing membrane repels the elements better than other products for flat roofs. Roofs that are prone to standing water face a high likelihood of leaks and water damage to the structure. Thanks to its superior adhesion and zero seams, our technology withstands standing water, protecting the structure from moisture. 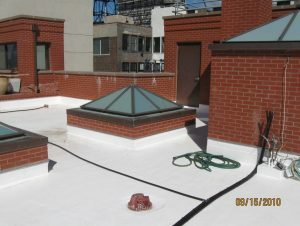 Commercial roofs in Vancouver demand a long-lasting solution that shields the structure from the elements. Our liquid-applied membrane, used around the world, is the preferred material for all types of commercial roofing applications. Our seamless waterproofing technology is easily applied to decks, planters and a variety of other home exterior applications. It comes in a variety of colours to suit nearly any design. Long-lasting, flexible and versatile, let Seamless Roofing Vancouver develop the ideal waterproof solution for your needs.